Vacuum Chamber, designed for product degassing. Stainless 304 chamber, durable and easy to maintain. Standard 1HP oil flooded vacuum pump. Pump capacity: 600L/min, max 2torr. 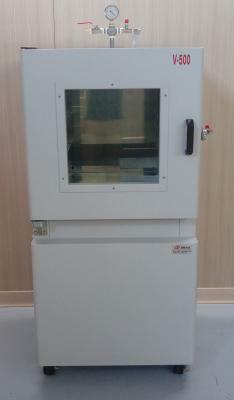 Heater---upgrade to vacuum oven with heater & PID controller. Automatic valves--- using pneumatic / solenoid valve to replace manual ball valve. Timer--- the digital timer allows user to setup required working time of vacuum pump. Digital gauge--- optional 1" digital gauge provides easy to read value. By integration of digital gauge, automatic valves & timer, user can setup the required working pressure & time.